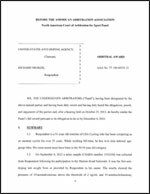 USADA announced today that a three member panel of the American Arbitration Association North American Court of Arbitration for Sport (AAA), rendered its decision in the case of Jon Drummond, of Grand Prairie, Texas, a coach in the sport of track & field sanctioning him for eight years for his doping violations. The independent AAA panel found that Drummond possessed, trafficked, and administered banned performance enhancing substances to an athlete under his care as a coach. “Coaches have an inherent responsibility to protect athletes- not take advantage of them- but to ensure that they receive the support, training and advice they need to win fairly and in accordance with the rules,” said USADA CEO Travis T. Tygart. Drummond, 46, will serve an eight year period of ineligibility beginning on December 17, 2014, the date of the arbitration decision. Drummond’s sanction prohibits him from coaching, training or advising athletes and participating or coaching at any event sanctioned by USA Track &Field, the International Association of Athletics Federations or any other WADA Code signatory. This includes the U.S. Olympic, Pan American Games or Paralympic Games Trials, being a member of any U.S. Olympic, Pan American Games or Paralympic Team and having access to the training facilities of the USOC Training Centers or other programs and activities of the USOC including, but not limited to benefits, grants, awards or employment.